One can imagine David Boon, Merv Hughes, or even Shane Warne (a decade ago) as Santa Claus, but Mark Waugh? For Indian fans however, Waugh is their Kris Kringle, bringing a bag full of goodies, albeit a couple of months late. The fans will forgive him the tardiness, considering Waugh and his fellow selectors’ generosity. The Indian batting order currently reads as follows: Murali Vijay, KL Rahul, Virat Kohli, Cheteshwar Pujara, Ajinkya Rahane, Karun Nair, Parthiv Patel, Ravichandran Ashwin, Ravindra Jadeja, Mohammad Shami and Umesh Patel. The top nine are reasonably accomplished batsmen, and while 18 months ago there were questions regarding Indians against spin, that phase is clearly behind them. Look at the career averages of just three of these players in Tests played in India against spinners: Vijay’s career averages playing Adil Rashid, Mitchell Santner, Rangana Herath and Ish Sodhi are 98, 76, 87 and 65 respectively. Kohli’s career averages playing Lyon, Rashid, Moeen Ali and Smait Patel are 50, 61, 167 and 114 respectively. Pujara’s career averages playing Graeme Swann, Imran Tahir, Patel, Nathan Hauritz and Sodhi are 56, 53, 104, 72 and 78 respectively. Given that background, it is mind numbing that Australia chose to go with four frontline spinners – Nathan Lyon, Steve O’Keefe, Mitchell Swepson and Ashton Agar – for their four Tests in India. To put this in context, Australia has never taken more than two spinners on a tour to the subcontinent in the past ten years. And if you thought that two of the spinners were there just as backup, both chairman of selectors Trevor Hohns and selector Mark Waugh hinted over the past week that Australia may play without Josh Hazlewood, using three spinners. Now that is icing on the cake for Kohli’s men. The greatest spin bowlers of our age, Shane Warne and Muttiah Muralitharan, struggled in India throughout their careers and averaged above 40. More recently, Herath’s average in India is around 50. Lyon averages 37 in India, which is not bad, but along with O’Keefe, he hardly evokes awe in a batsman’s minds like Warne or Murali. 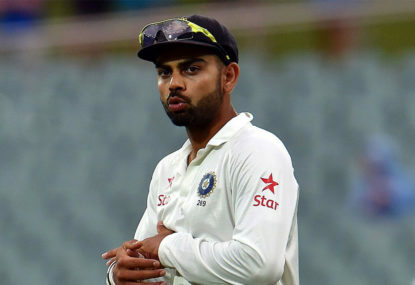 Importantly, Kohli has made it clear that he does not want or encourage rank turners. So doctored pitches, as was apparent during the England series, have probably died a quick death, with the change in leadership and the confidence the current crop of players have. What would make sense, given the experience of New Zealand and England recently, is Australia relying on their strength rather than falling into the misguided trap of thinking that the bowling attack needs to suit the condition they perceive will prevail. Dropping Hazlewood and choosing to go with three spinners would be like undertaking a foray into enemy territory with no exit plan. The last time that happened, Lord Tennyson was around to pen a poem about it. Perhaps this time, a modern poet will call it ‘The Charge of the Spin Brigade’?